Watch Intro Movie! See also “Tips and Hints”! Q: How do I get Twittelator Pro? 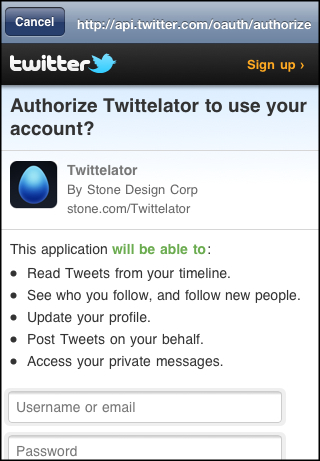 Q: What do I need to use Twittelator Pro? A: If you don’t have a Twitter account - go get one! Even without an account, you can still check out the Twitters of Everyone and do searches based on any criteria. And of course, you’ll need an iPhone or iPod Touch updated to the latest iPhone/Touch OS from Apple. When you launch Twittelator, just fill in your Twitter Screen Name and Password, and you are off and twittering! You’ll be able to post Tweets and Pictures directly from your iPhone to TwitPics, Pikchur, Plixi, yFrog and 5 more sites! Q: Developer API ? A: Of course! Q: How do I update to the latest Twittelator? A: Get V4.6.1! You use iTunes on your desktop - here�s a complete how-to guide to updating. Q: Arrgh! Once in a while, camera snapshots are causing a crash! A: We know, Apple knows - it�s an out-of-memory situation which plagues many applications. Workaround: take photo using �Camera� app, and then bring photo into Twittelator from �Library�. We hope Apple will fix this! Q: Arrgh! Going to certain websites crashes Twittelator! A: We know, Apple knows - again, it�s an out-of-memory situation. You can try reducing the number of tweets you receive to save some memory. You can reboot your phone as well. Q: Can I send Web Page Links from Safari to Twittelator in a new tweet? A: Yes - it�s easy - and you can even make a BookMarklet to automate the process. We wrote this page to teach you how! Q: How do I get good Nearby (local) Search results? e. switch on 'Auto Update Location' in Settings - the gear icon - to geocode your tweets. Q: I just got Twittelator Pro and I can't get any Tweets - I keep getting the following error: NSURLErrorDomain error -1012. A: You may have entered your Screen name and/or Password incorrectly. Both are case sensitive so enter them carefully. Click the "Account� item in More to get edit the bad account. Tap the ">" (blue chevron) icon to edit the bad account. Enter your screen name and password carefully, Tap Done. Go to My Tweets to see if it can correctly retrieve your account. Q: I've noticed since I upgraded to the 3G phone and sw v2.1 that every time I start the app it asks for permission to use my current location, and I have to manually disallow it every time. I don't remember this being true on my 2g phone with sw v2.0.2. A: You can totally turn off GPS with Use GPS switch in Settings. Of course, you won�t be able to get maps or auto update your location, but that is the tradeoff. Q: When i have high resolution photos enabled in twittelator pro, and i send a tweet with a picture, i don't see the tweet anywhere in my list of msgs. However when i log into twitter.com and check out twitpic, i see the pictures there. is that normal? are high res pictures when sent in a tweet not actually sent out but just uploaded to twitpic? 2. When twittelator receives the "A-OK" from TwitPic, it then posts the URL and your Tweet as a new Tweet. 3. did you wait long enough? Give it a minute or two! Mine go up best when I'm on wifi for sure, and sometimes, I do need to tap "Refresh" icon in bottom left to see the new tweet posting. Q: WIll it be possible to kilometers instead of miles in the nearby serach? After a search the search is stored in the search list. When I use the nearby search again a new search with my coordinates is stored in the list. Often two or three times. RE: Saving - this is where it's the accuracy that makes it look like they are identical searches but your phone may have reported a different location. Q. How do I delete my tweets? A. Tap your name on the tweet to delete. Tap Delete Tweet. This is not undoable! Q. I tried sending a Private Message (aka Direct message, 'd USERNAME') but I got back an HTTP Error - why? be mutually following for direct messaging to work. To sum up: If they are following you, you are allowed to direct message them. However, since you don't follow them, they are unable to reply back to you.